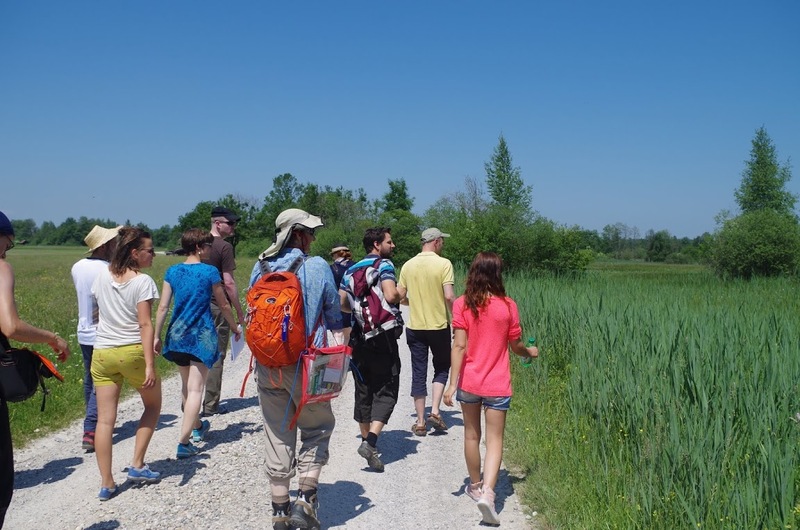 Last year several students and I blogged about the first place-based workshop with the Environmental Studies Certificate Program. This year we built upon our 2014 experiences at Osterseen. 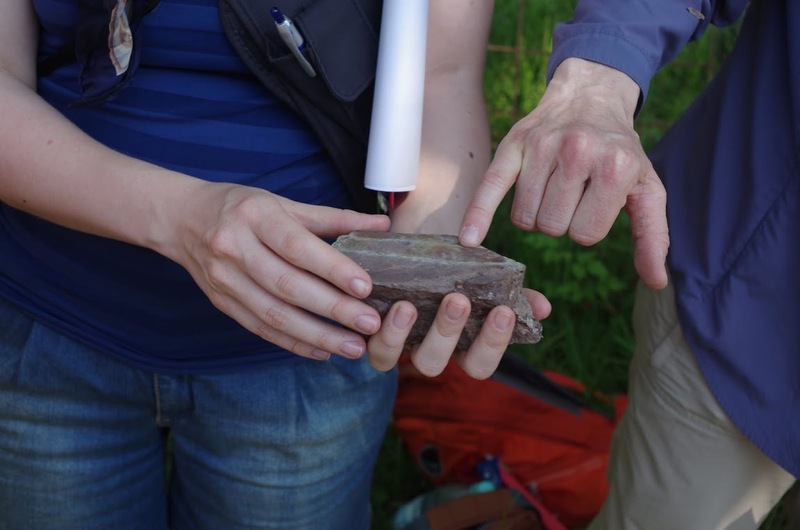 I was fortunate to collaborate once again with Professor Anke Friedrich (LMU Geology) and Tobias Schiefer, a landscape conservation practitioner. 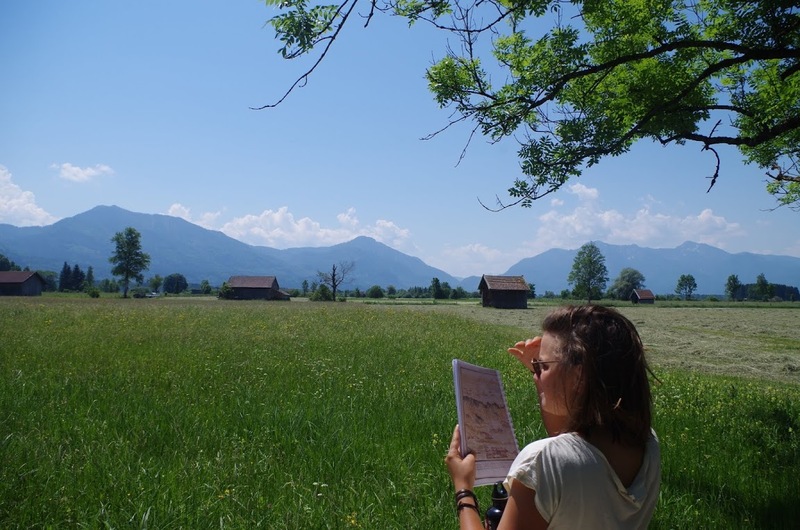 Carson Fellow HaI Crimmel and Professor Markus Vogt (LMU Katholische Theologie) joined the group along with program student Dorothea Hutterer, who led a walking session on reading landscape history and interpreting historic maps from the Bayerisches Hauptstaatsarchiv. 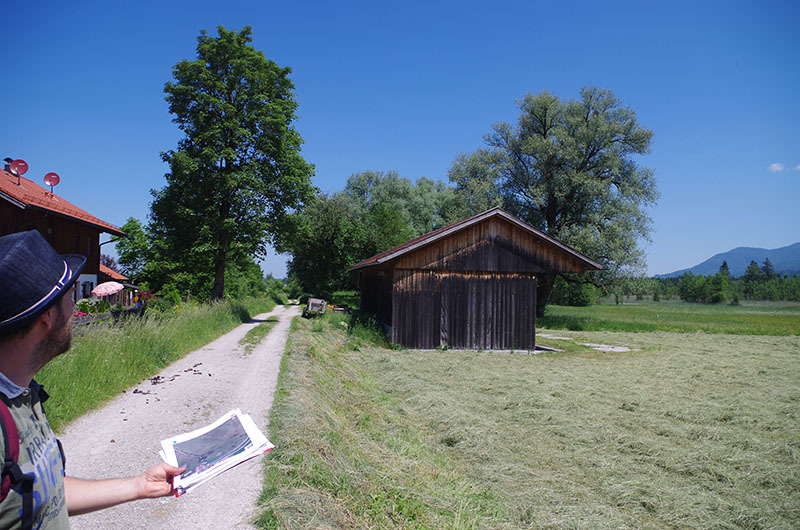 Over two days we explored the former Benediktbeuern Klosterland—a mosaic of fields, wet meadows, moors, forests, and alpine foothills. 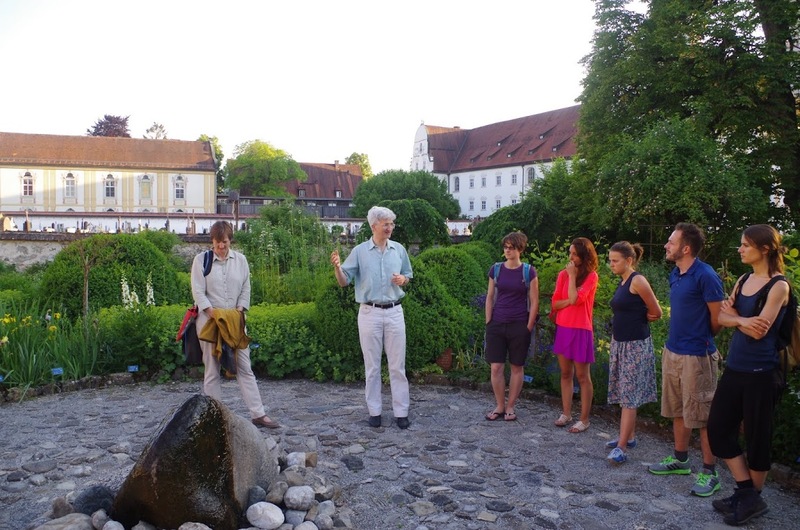 It has served as an area of continual agricultural settlement since the eighth century; since 1988, it has also been home to the Zentrum für Umwelt und Kultur, which is devoted to supporting renewed cultural value for the environment. Our arrival coincided with the G7 summit in nearby Elmau: the courtyard of the renovated seventeenth-century Maierhof where we stayed served as a temporary parking spot for police staffing a roadblock on the A95. 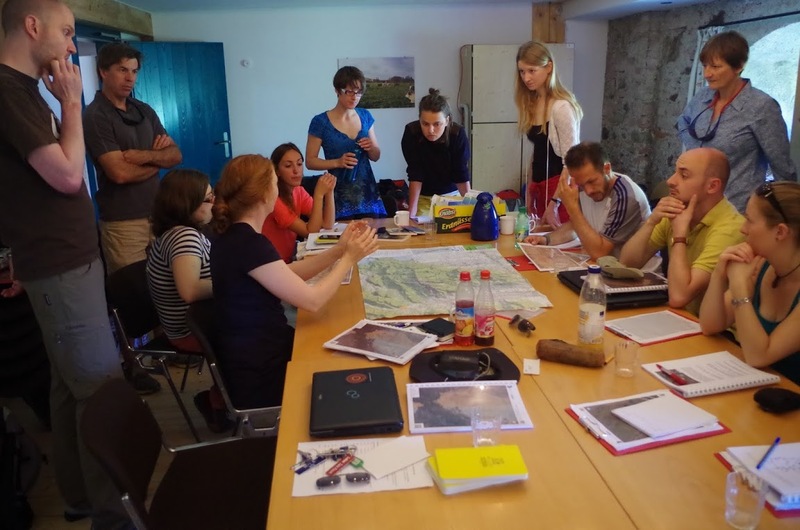 I experienced the workshop as enriching as a framework that makes the processes through which different disciplines approach/see/read the environment explicit, and that encourages us to reflect on how to make our own practices of interpreting landscapes tangible. 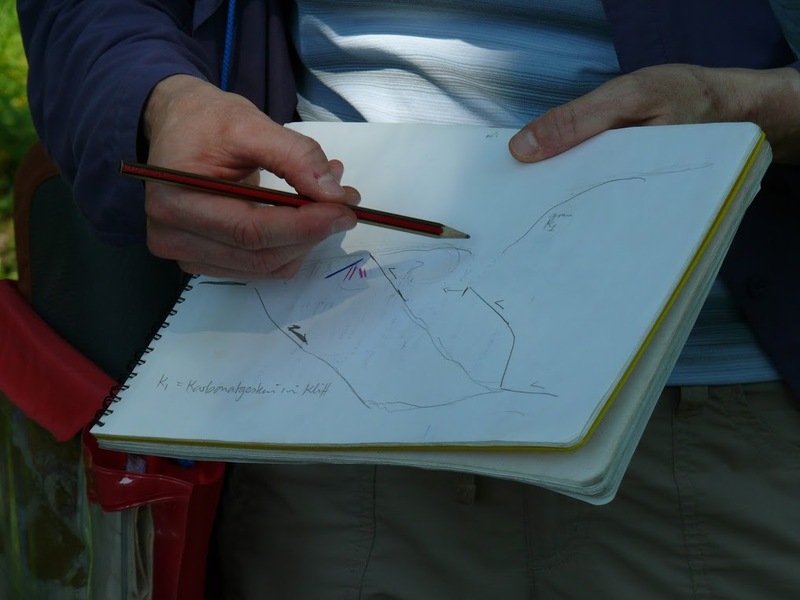 I enjoyed seeing people from different disciplines enacting their approach to “the field”: how they touch stones or plants, look at landscapes and develop a sketch, or hold and correlate different maps. I noticed how the different perspectives/approaches relate to and enrich each other, gradually giving an interpretation more depth. We always had enough space to experience new perspectives by ourselves: finding out the story behind a fallen tree; being exposed to interpreting an old map and its legend; realizing it is actually possible to unfold (parts of) the map’s story. 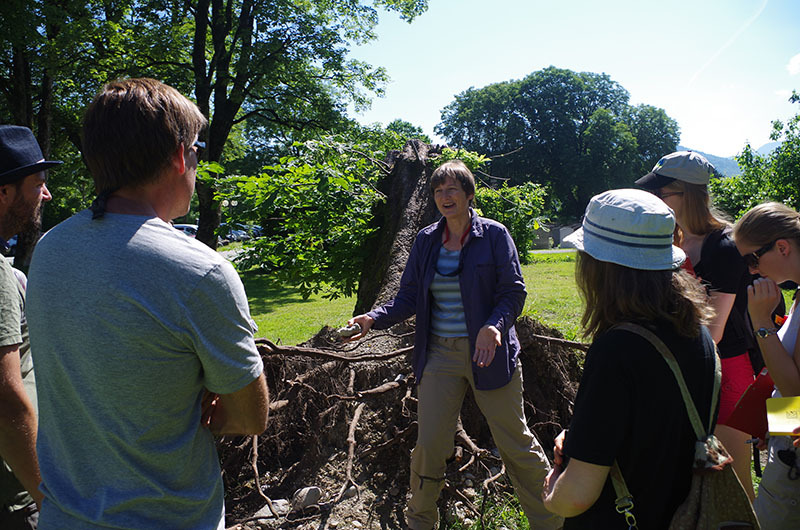 Prof. Anke Friedrich started the workshop by using a downed chestnut tree (over 200 years old) to peel back the soil profile, shown here with a nice chunk of the Kalkalpen. We also found good-sized bricks tangled in the roots of the tree—evidence of earlier structures on the site of the monastery. Perhaps the tree—a beer garden favorite—was planted around the secularization of the older Benedictine monastery in 1803. Photograph: Robert Emmett. 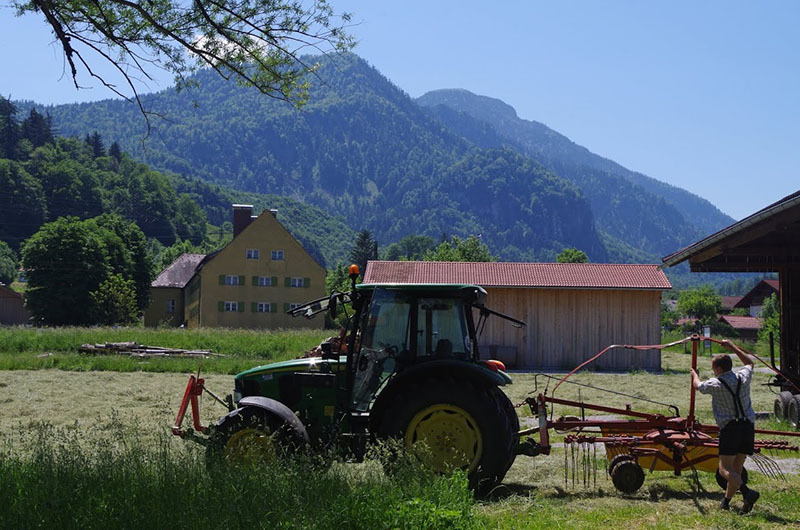 We were fortunate to be able to ask the farmer exactly why he mows this area for hay but not the adjacent field—he confirmed the distinction described by Tobi Schiefer between Streuwiesen (wet meadow mown once annually, a protected habitat for ground-nesting birds) and Heuwiesen (dry meadow mown for fodder). Photograph: Robert Emmett. Comparing satellite images and our observations on the ground: What accounts for these lines between dominant vegetation types and land use practices? Photograph: Robert Emmett. Soil types. Photograph: Robert Emmett. Observing butterfly species. Photograph: Stefanie Schlosser. Sketching observations. Photograph: Julie Weissmann. Friedrich explains her observations. Photograph: Robert Emmett. Freidrich explaining rock types. Photograph: Robert Emmett. Vogt joined us on the Thursday evening. Photograph: Robert Emmett. The Maierhof became an informal parking lot for police cruisers during our stay. 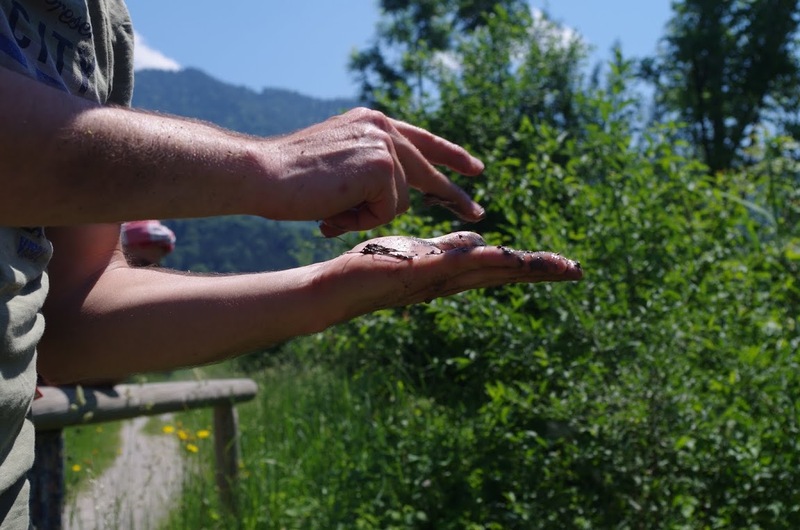 The police presence reflected the proximity of the A95 roadblock set up to manage civil society participation in the G7 talks taking place at Schloss Elmau/Garmisch Partenkirchen. Photograph: Robert Emmett. 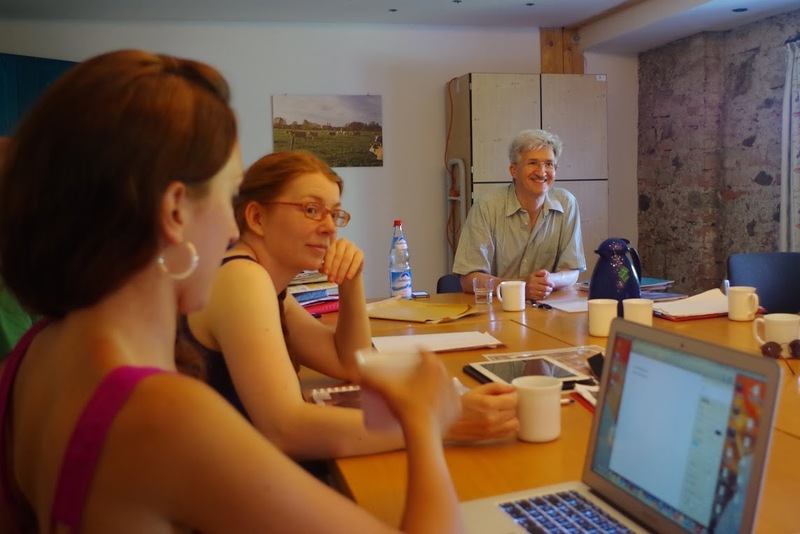 Vogt presented a view of sustainability as rooted in monastic practices going back to the eighth century at Benediktbeuern, while emphasizing the need for a cultural transformation in the present to move toward a more sustainable society. Photograph: Robert Emmett. Dorothea Hutterer leading Friday’s session on interpreting maps from the archives, before the group headed outside to read landscape transformations. Photograph: Robert Emmett. By Friday, everyone could explain the underlying factors influencing the distinct vegetation communities on either side of the road on which we walked westwards from the monastery. Photograph: Robert Emmett. 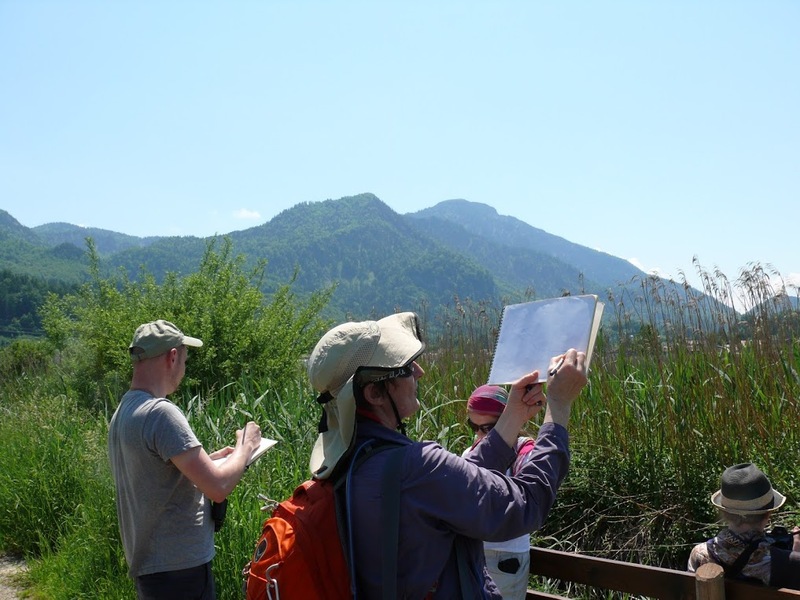 Observing landscape transformations. Photograph: Robert Emmett. Interested? 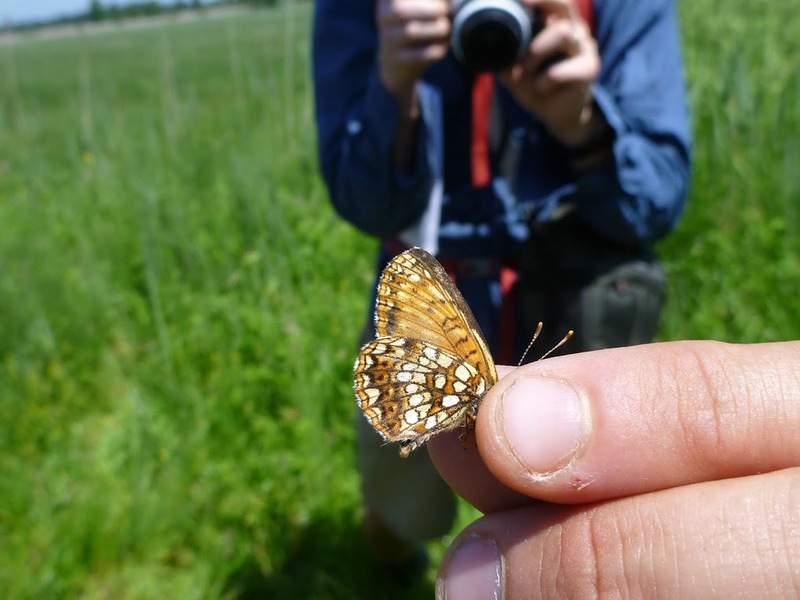 We’re enrolling new students onto the Environmental Studies Certificate Program for fall —more information can be found here.